"An Evaluation of the New King James Bible" (Spring 1980) highlights improvements in translation clarity and consistency of the New King James Bible: New Testament over the traditional King James Version, although the Greek textual basis adhered to, i.e., the textus receptus or so-called "Majority Text," represents a throughback to pre-Enlightenment days. For a good argument in support of the Wycliffe-Tyndale-King James tradition for English translations of the Bible, from the perspective of an expert in English grammar and literature, see Leland Ryken, The English Standard Version and the English Bible Legacy (Crossway, 2011). 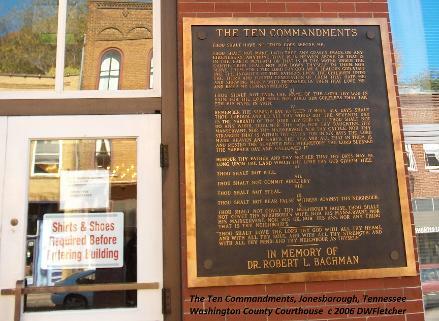 Just to the right of the main entrance to the Washington County Courthouse (above left) in Jonesborough, Tennessee, a bronze broadside or plaquard (above right) is posted that contains the full text of "The Ten Commandments" (from Exodus 20.3-17) and The "Greatest" and "Second Greatest" Commandments of Jesus (from Luke 10.27). These scriptures are taken from the King James Version of the Bible and are displayed in memory of Dr. Robert L. Bachman. 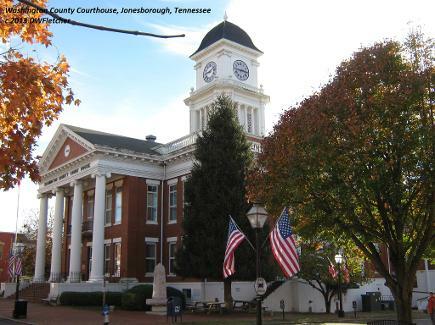 In the northeastern part of the state, Jonesborough is Tennessee's first town, and Washington County is Tennessee's first county. "The Initial Conquest: Jericho" (Joshua 6:12-21) and "A King After God's Own Heart" (I Samuel 16:4-13) appeared in the 20th Century Christian Adult Bible Quarterly for the Fall of 1986. "The Perseverance of Job the Patriarch" (2001; revised 2018) briefly overviews the story of the suffering patriarch and highlights his persistent faith in Yahweh in light of the tragedy he experienced. "The Deity of Christ in the Psalms" (January 1979) is a short devotional study about the use of select Messianic passages in the Psalms by New Testament writers. An excellent study tool, The Comparative Psalter: Hebrew-Greek-English, published by Oxford University Press (2007), has the Masoretic Text, the Revised Standard Version (1952), the New English Translation of the Septuagint (2000), and the Septuagint side by side in parallel columns. A brief overview of the psalms - Gordon Wenhan's The Psalter Reclaimed: Praying and Praising with the Psalms (Crossway, 2013) - devotes chapters to Singing & Praying the Psalms, Reading the Psalms Canonically & Messianically, the Ethics of the Psalms, the Imprecatory Psalms, and the Nations in the Psalms. "Amos 2.1-3, God's Judgment against Moab: The Prophet's Method, Message, and Theology" was presented at the 16th Annual Stone-Campbell Journal Conference at Johnson University (Knoxville, TN) on April 7, 2017. 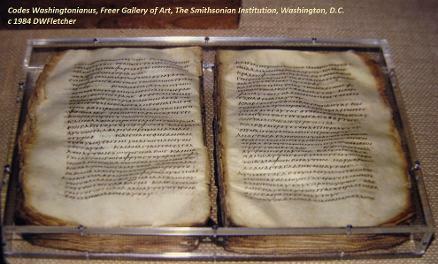 Codex Washingtonianus (Biblical Uncial 032, above left) is a late fourth or early fifth century copy of the Four Gospels in the so-called Western Order (Matthew, John, Luke, and Mark; see wooden cover above right). It is housed in the Freer Gallery of Art at The Smithsonian Institution in Washington, D.C. For a good overview of this biblical manuscript and its importance for New Testament textual criticism, see Bruce M. Metzger, The Text of the New Testament: Its Transmission, Corruption, and Restoration (Second Edition; Oxford University Press, 1968), pages 56-57. The divinity of Jesus and its emphasis in John's gospel is examined in "The Deity of Christ in the Gospel of John," published in the Firm Foundation (March 1980) and revised in February 2011. "Baptism in the New Testament" develops the theme that God uses Christian baptism, through the work of Christ and the Holy Spirit, to bring about a new beginning for believers individually and for his church collectively. Based on New Testament texts, the study (available in endnote and footnote versions) is Chapter 10 in Baptism and the Remission of Sins: A History of Baptismal Thought in the American Restoration Movement, edited by David W Fletcher (1990; repr., Hester Publications, 2009). For two good brief works that explain the work of the Holy Spirit in the church historically and by Protestants theologically, see William K. Kay's Pentecostalism: A Very Short Introduction (Oxford, 2011) and Edmund J. Rybarczyk's The Spirit Unfettered: Protestant Views on the Holy Spirit (Paraclete, 2010). "The Apocalyptic Logos of Luke in Acts of Apostles" (April 2015) highlights Luke's use of Joel's endtime prophecy as a keynote for the book of Acts. See too the full website - Apocalyptic Rhetoric in Acts of Apostles. The paper was presented at the Fourteenth Annual Stone-Campbell Journal Conference in Indianapolis, Indiana. "Kingdom Theodicy in Acts of Apostles, Acts 27-28: Seeing God's Handiwork in Situations of Life (Storms, Shipwrecks, Snakes, and Sicknesses)" looks at Paul's voyage to Rome, the travel narrative of the last two chapters of Acts, to emphasize God's providential care for his apostle. It is suggested that this segment of Luke's narrative provides the reader with a "kingdom theodicy" to encourage believers to trust in God's care during times of trouble. The paper is to be presented at the Eighteenth Annual Stone-Campbell Journal Conference in Knoxville, Tennessee, in April 2019. "The Life of Paul the Apostle" (June 1975; revised February 2011) gives the reader a quick summary of the life of Saul of Tarsus based on a basic, elementary reading of the New Testament book of Acts and a few, uncritical popular commentaries. For two critical, excellent works on the Pauline Corpus, see Wayne A. Meeks and John T. Fitzgerald, eds., The Writings of St. Paul, 2nd ed., Norton Critical Editions in the History of Ideas (New York: W. W. Norton, 2007), and John Muddiman and John Barton, eds., The Pauline Epistles, The Oxford Bible Commentary (Oxford: Oxford University Press, 2010). 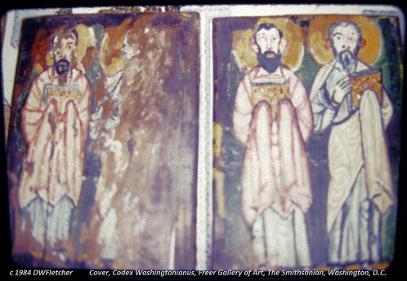 The first paper surveys biblical and extrabiblical evidence about beginnings of Christianity in the Imperial City. The second paper, a brief "special introduction" to Paul's letter to Rome, relies on internal evidence and a few older works of the New Testament Introduction genre to answer basic questions such as authorship, origin, destination, occasion, purpose, and so forth.